We are pleased to announce the arrival of our brand new Staircase and Handrail Parts brochure. 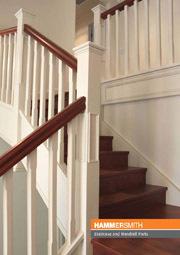 This brochure showcases all of our DIY Stair Parts that we have available for sale. There are nearly 100 new products that have been added to our range, and over the next few weeks they will slowly be added to our website for online purchase. Prior to them being added to the website, they still can be purchased by making a phone call, sending a fax or by email. • Designer Rail - The combination of timber handrail and stainless fittings. • Stainless balusters in both round and square profiles. • Timber treads (steps), stringers and risers. Download the catalogue by clicking on on the link below. If you are looking to build a staircase for inside use; we have a range of timber handrails, timber balustrade and handrail brackets to choose from for DIY Stairs.